Once again I have made a cake and did not take pictures like I should have. I get going and I am so into making the cake that I forget to take pictures. I used a 4 in round pan. I used four and a half 4 in cakes for this cake and stacked them with frosting between each one. The cake was approx nine inches tall. I used three cake boards between layers with thick straw supports. I then crumb coated the whole think with buttercream frosting. I colored the fondant grey. After I applied the fondant I sprayed it with shiny silver edible paint. I cut the letters out with my silhouette. You can use sugar sheets for this. If you don't have a cutter you can use stencils and cut with an exacto knife. Then apply with a little water. Wow... great job on the cake! The only way that cake would be better was if it was DIET PEPSI! All joking aside that looks like it takes some talent! I don't have much of that BUT I can eat cake like a champ! I am hosting today at http://www.frugalfitfamily.com - swing by if you can! You did an incredible job on that cake! This cake is fantastic! Well done - I am seriously impressed - it looks so realistic! 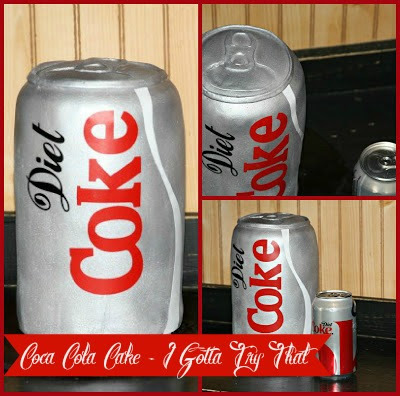 WOW I thought that was a coke can at first. Great Job!!! thanks for sharing on We Made That! I have made a Coco-Cola Cake before but never with a box mix. Good idea, so easy. Your fondant is so great! Wow!! I am visiting with BWML blog hop. I followed you on GFC. OMG this is crazy! LOL, I thought that was a real Diet Coke from the thumbnail picture. This is so creative! Thanks for sharing this on Domestic Superhero's link party this week! This is amazing. You did a great job. Thanks so much for sharing with Wednesday's Adorned From Above Blog Hop. Have a great week. That cake is Amazing!!!! I'm craving a Diet Coke now!!! ;) Pinning! I totally pinned this today and I didn't even know it was yours! Love it! I can't believe that is a cake! That is awesome! That cake is great, you did an amazing job! Thanks again for sharing this at my link party last week! I will be featuring it on tomorrow's Link Party Features! Hope to see you back this week! Thanks! That cake is AMAZING!!! Wow!! You did an awesome job! Thanks so much for sharing at Thursday's Temptation. Your link got the most views this last week so I am going to be featuring it tonight at this weeks link party!